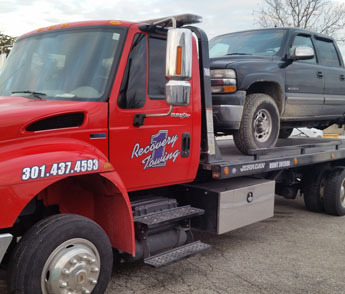 When you need towing service, trust Recovery 1 Towing LLC to get your vehicle where it needs to go safely and securely. We offer reliable flatbed tow service for cars and trucks of every kind. Our flatbed towing company in Upper Marlboro, MD, takes pride in our reputation for providing fast, safe, and timely flatbed towing. Our flatbed towing company is licensed, bonded, and insured. We have experienced drivers that are adept at securing vehicles onto the tow truck. They are also highly skilled at driving with any type of car or truck attached, which is extremely important when it comes to flatbed towing. We show the utmost care with every towing job, so you can rest assured your vehicle is in good hands. Depend on our skilled drivers when you need flatbed towing service. We are available 24 hours a day, 7 days a week. Our towing teams maintain very fast response times, so you never have to wait long before the help you need is pulling up to your location. Our careful experts know how to properly attach all types of vehicles to our flatbed tow trucks, expediting the process of getting your vehicle towed. Put your trust in our reliable flatbed towing service. The flatbed trucks we use are larger than traditional tow trucks, allowing us to accommodate larger vehicles that need to be towed. One of the benefits of our flatbed towing service is the care we take in towing your car. There is almost no risk of a vehicle suffering additional damages while being towed by a flatbed truck. This is especially true when one of our experienced drivers is doing the towing.